Sharon Brock, MS, is a content editor for LIVESTRONG.COM with a focus on health. Brock was previously the lead editor for two medical publications at USC medical center. She was pre-med as an undergraduate and earned a master's degree in journalism from Columbia University. You can find Brock's work in several publications, including Yoga Journal, 7x7, New You and Healthline.com. It's common to get water stuck in your ears after going swimming or taking a shower. Water in the ears causes a tickling sensation and sometimes affects your hearing. This water usually drains out on its own, however, if it doesn’t and you don’t remove it, it could lead to infection causing pain, redness and inflammation. The infection of the external ear canal is commonly known as swimmer’s ear and is caused by pseudomonas bacteria found in water and soil. You can coax the water out of your ear by pulling down on your earlobe and tilting your head toward your shoulder. You can also try jumping up and down in this position, or simply giving your head a good shake when you get out of the swimming pool. In many cases, you'll feel the water drain out easily. The motion of yawning or chewing can help ease tension in the Eustachian tubes, which are passageways that connect the middle ear to the back of the nostrils and regulate air pressure. Fluid can build up and get trapped in the Eustachian tubes, but these movements can open the tubes and release any water that may be stuck. You can also try the Valsalva maneuver to open the Eustachian tubes and push water out. 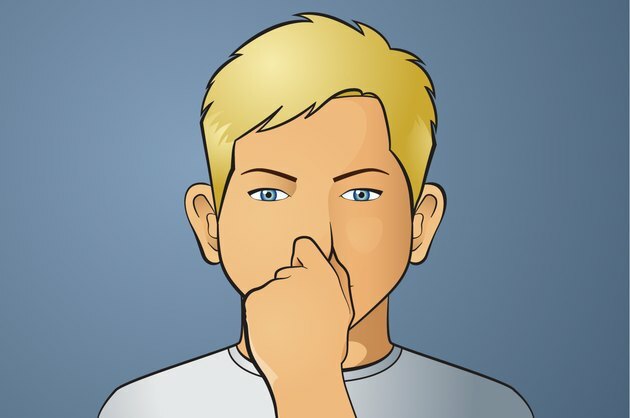 To do this, take a deep breath in, close your mouth and pinch your nostrils closed with your fingers. Gently and slowly exhale until you hear a slight popping sound, which means the Eustachian tubes are open again. Don’t exhale too hard or too fast as it may cause damage to the eardrum. Face the affected ear down on your palm and gently push in toward the ear and then cup your hand so that the palm moves away from the ear. Continue to push in and out with your palm. This will create a suction-like vacuum that will draw the water toward your hand. Don’t do this with the ear facing upwards or you may drive the water farther into the ear canal. If the palm is not creating a tight enough seal, try using your fingertip to create a vacuum. To do this, tilt your ear toward your shoulder and cover the hole of your ear with your fingertip. Create a vacuum by pushing in and then releasing. Repeat this motion rapidly until water begins to get drawn out of the ear. Be sure to just cover the hole of the ear canal and not stick your finger into the ear. Also, make sure your finger is clean and your nails are short as scratching your ear canal may cause infection. It may seem strange to use a blow dryer to remove water from your ears, but science proves that whenever warm dry air passes over water, it pulls away water vapor. You can apply this same logic to pulling moisture out of your ear. 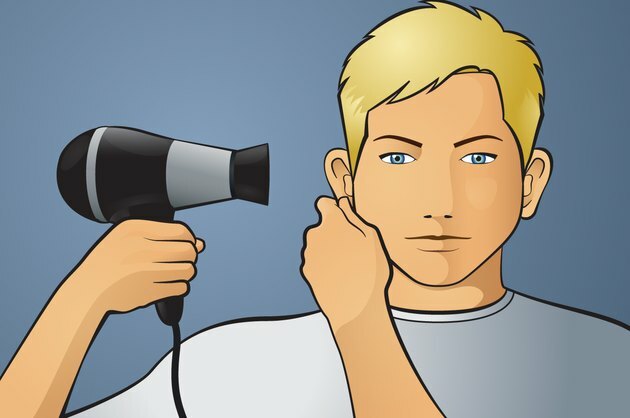 With your blow dryer set to its lowest heat and air flow settings, pull your ear lobe away from your body, hold the blow dryer about 1 foot away from your head and blow air back and forth across your ear. You may also try blowing air directly into the ear for approximately 30 seconds. Be sure to hold the dryer at least 1 foot away from your ear and keep the heat setting low to avoid burning yourself. Using a heat compress can also help open up the Eustachian tubes. To use heat, dip a washcloth in a bowl of hot water and wring out the excess water. 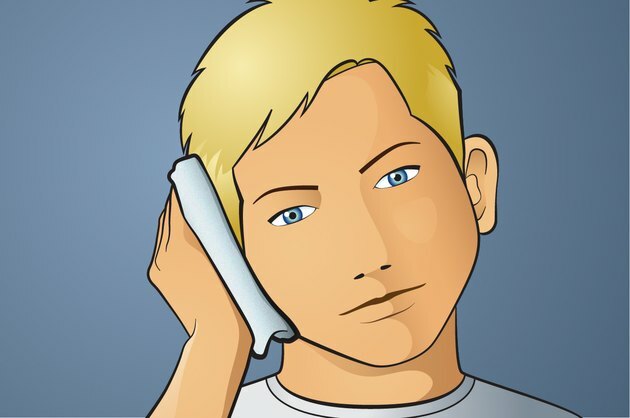 Place the hot washcloth against the affected ear for 30 seconds. Wait for a minute, and then repeat 4 times. Lie down on your side to help the fluid drain out. Inhaling steam can also open the Eustachian tubes and free water from your ear. To try this approach, boil water in a pot on your stove. 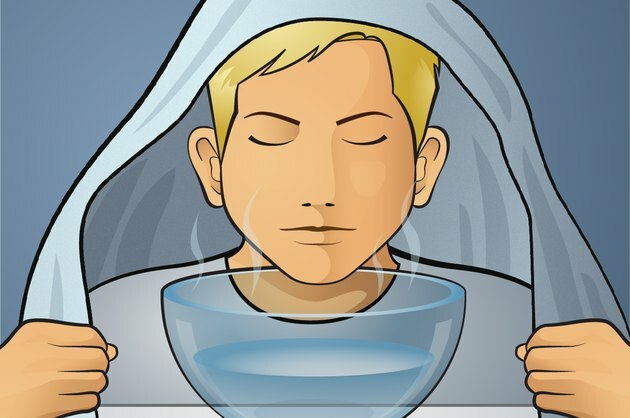 Cover your head with a towel, put your face down toward the bowl and inhale the steam slowly for 5 to 10 minutes. Tilt your head to one side and water should start to drain out of the ear. You can also try this in a hot shower for the same effect. 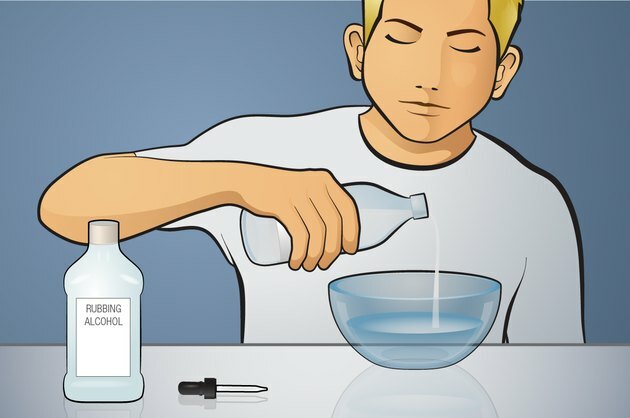 Create your own ear drops by mixing a solution of 50 percent rubbing alcohol and 50 percent white vinegar. Carefully use an ear dropper to place a few drops into the affected ear. Gently rub the opening of the ear canal and wait 30 seconds. Tilt your head sideways to let the solution drain out. It may take a half hour or so for this remedy to work. The acid in the vinegar acts to break down earwax that may be holding water in the ear canal, while the alcohol evaporates water as it dries. Both white vinegar and rubbing alcohol kill germs, so this solution also helps fight infection. If you do not have white vinegar, you can substitute water in the solution, but be sure to use distilled water to avoid introducing any bacteria or minerals into the ear. If you have a punctured ear drum or already have an ear infection, do not use this remedy. The acid in the vinegar can cause pain to a punctured eardrum and rubbing alcohol can be painful to an infected ear. Hydrogen peroxide is another effective option to get rid of water in ear. Due to its effervescent property, hydrogen peroxide can easily remove the trapped fluid, along with ear wax and other debris from the ear canal. 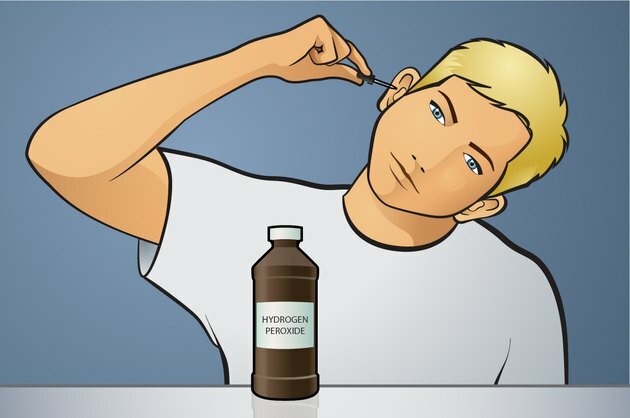 For this approach, use a dropper to place four drops of 3-percent hydrogen peroxide into the affected ear. Allow it to settle for 1 or 2 minutes. Tilt your head sideways and allow the fluid to drain out easily. Olive oil has many surprising uses, including getting water out of your ear. It also has antiseptic properties so it can reduce the risk of ear infection. Plus, putting a couple drops of olive oil into each ear before going swimming will lubricate the ear canal and help prevent water from getting trapped in the ears. For this approach, slightly warm some olive oil in a small bowl. 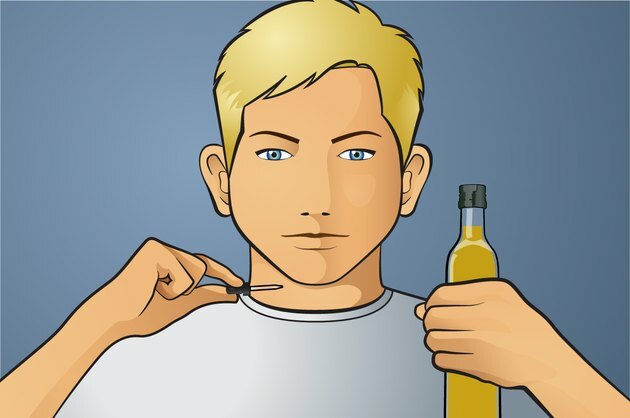 Use a dropper to place a few drops of warm olive oil into the affected ear. Allow it to settle for 10 minutes. Tilt your head sideways to allow the oil and fluid to drain from the ear. You may purchase ear drops at a pharmacy designed specifically to dry ear canals. These types of drops dry excess water in the ear using a combination of isopropyl alcohol and anhydrous glycerin. You can also buy absorbent earplugs or a hand-held ear dryer to draw water from your ears after swimming.